Naomi Wachira is a Kenyan-American music artist living in Yakima today. KBCS’s Sonya Green asked Wachira about her approach to music at our studios a few years ago. Also included in this segment is Naomi Wachira’s new release “Heart of a Man”. 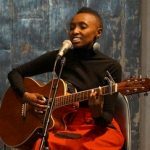 Naomi Wachira will be performing at SoFar in Seattle on June 29th.